This week your financial situation can change a lot, and it depends not only on you, but also on the mood of your patron planets. Many Zodiac Signs stars will be able to provide additional assistance, and someone will have to work hard. You can find out more about this in the weekly financial horoscope. To increase their income, in the period from May 14 to 20, the signs of the zodiac will have to become more active. Someone needs to be attentive and beware of fraudsters, otherwise you risk losing everything you earned by difficult ones. However, some zodiac representatives expect financial success. First of all, it concerns those whose patron planets will move to an enhanced position. If you want to improve your financial situation, do not neglect the good advice of astrologers. In difficult times, they can be your indispensable helpers. During the week, enhanced Mars will be able to provide additional assistance to Aries. Antagonist-Venus will be weakened, which means that in difficult situations it will not interfere with you. During this period, astrologers recommend you not to lose time, be active and build relationships with management. A close relationship with your boss will help you rise to a higher level and achieve success. You should not put money in the foreground, because career growth is no less important. At the beginning of the week, the Moon will help you in any endeavors. At this time, it is necessary to postpone minor matters and give preference to more important ones. However, in order to realize your goals, you will need motivation. Before you act, think about why you are doing this, and then you will definitely succeed. Strengthened Mars will be a serious obstacle for you. His influence may have an extremely negative impact on you, and first of all it will affect communication with colleagues and superiors. Astrologers advise Taurus to control emotions and not to take criticism to heart. Tips from more experienced employees can help you get closer to your goal. Saturn Retrograde is your main assistant this week. Thanks to his support, you can take a break from troubles and devote time to yourself. Do not spend too much time working. Even with your intensified efforts, the antagonists Mars and Neptune will do everything to upset your expectations. Unfortunately, during this period all attempts to increase your income can turn out to be failures and large monetary losses, even if you are sure that the risk is justified in this situation. From 14 to 20 May, astrologers strongly recommend that Gemini avoid new acquaintances and communicate with people who do not inspire confidence in you. Perhaps it is intuition that will help you avoid serious problems. The coming week will not bring the Cancers serious financial losses. However, no major achievements should be expected. Despite the enhanced energy of your patron, the Moon, Mars will not allow you to get closer to your goals. Astrologers advise you to be careful in handling money, especially at the end of the week. On Sunday, the energy of the night luminary will weaken, but your opponent will continue to watch you, which means that they will be able to harm you at the moment when you do not even expect it. If this day you have the opportunity to stay at home and do household chores, better do it that way. Only in this case, the antagonist will not be able to create additional difficulties for you. The struggle of the planet-patrons and antagonists can not affect the energy of Lviv. First of all, it can affect your emotional state. Sometimes it will seem to you that your work no longer brings you pleasure, and the payment for your work is greatly underestimated. Such dissatisfaction can cause serious conflict with management, which is why you risk losing your job. Do not give in to emotions and go on about negative thoughts. Perhaps next week you will realize that your behavior was unjustified, but to correct the act will not work. Dev this week expects a grandiose success. Luck will accompany you literally in everything, be it work, personal life or finances. The moon will help you escape from the problems, enjoy the romance and be with your loved one. The influence of enhanced Mars will give you vigor, which will have a good effect on your work. Any of your ideas will be considered by management, and your initiative will be a reason for a good reward. Also not expected problems with money. Rather, your activity will help you to increase your income, and the desire for higher earnings will help you realize your dream. There is no need to expect any special support from the Liberal planets. However, retrograde Saturn will often give you tips on how to act correctly in a given situation. Do not forget about the influence of enhanced Mars, which is able to push you to rash actions. 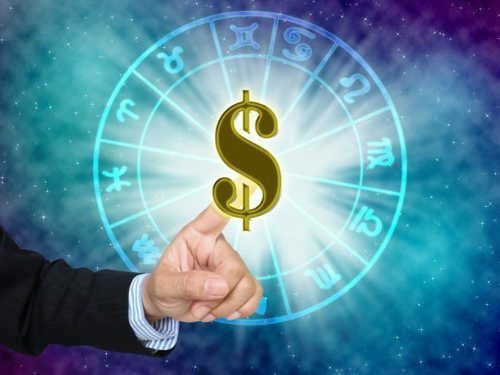 To avoid major financial losses, during this period, astrologers do not recommend you take loans, enter into questionable transactions and believe promises about quick earnings. This week even intuition can let you down. The coming week will bring Scorpios a lot of joy and experience. Enhanced Mars and the Moon will start the fight as early as Monday. It is at this time that astrologers advise you not to engage in important negotiations, conduct financial transactions, and look for work. The risk of failure and deceived expectations is too great. Perhaps money problems will not pass you by. Therefore, to make purchases, invest money and make deals is not worth it. Fortunately, the black bar will not last long. Already on Wednesday the night light will become weaker, and on Sunday it will completely lose its strength, therefore, it is better to plan the most important things for May 20th. At the beginning of the week, Sagittarius can face serious problems that will affect your financial situation. Mars, which is in a reinforced position, will defend you with all its might from your antagonist, the Moon. However, this will not always bring a positive result. In the middle of the week, the energy of the night star will weaken. During this period, you will have a great opportunity to build relationships with colleagues, management or business partners. The most successful day for Streltsov is Sunday. From this day on, your opponent will finally weaken, and will not disturb you for a very long time. Between May 14 and 20, Capricorn should postpone all personal matters and actively begin work. Your patron Venus will weaken, which means that no success is expected in the love sphere. Mars and Saturn, on the contrary, will remain in a strengthened position, so there will be no problems when performing work duties. According to astrologers, at this time Capricorns should overcome their laziness and take on additional work. The pursuit of financial success and career growth is peculiar to you, so do not miss the opportunity and realize your goals this week. Representatives of this Zodiac sign are in danger of being tempted to make a useless, but expensive purchase. To avoid such a rush will be very difficult. To do this, you will not only have to abandon the shopping trip, but also not to visit the online market. The influence of Mars can affect your energy and productivity. During this period, the risk of fatigue and apathy is likely. Astrologers advise you not to overload yourself with hard work and additional responsibilities. This week your efforts may be ineffective. Saturn Retrograde is among your most dangerous enemies this week. His influence can divert your attention, which means there is a chance that you will miss a good opportunity to change your life for the better and improve your financial situation. However, in difficult situations, the Moon and Mars will stand on your side and protect you from trouble. Patrons will give you strength and confidence that will help you cope with financial difficulties. During this period, it is worthwhile to acquire useful connections and communicate with more successful people in order to gain experience.